"Y'ever notice the people who think that Trump will be a bad president are the same people who thought that Obama will be a good one?" Well, duh... that goes without saying. Obama's a Democrat and Trump's running as a Republican. It's not even an interesting observation. It's certainly not thought-provoking. It's also not entirely true. Look... we know that memes use absolutes for dramatic effect, so we have to just infer qualifiers like "some", "many", or "most" (though which one you infer is subjective). But the far more interesting observation is that many of the people who thought Obama would be a bad president also think that Trump would be a bad one. Those people foresaw the narcissism, the inexperience, the self-aggrandizement, and the willingness to ignore the legislative process and rule of law that Obama brought to the White House. They have a proven track record predicting bad presidents. And they see exactly those same tendencies in both Donald Trump and Hillary Clinton. And here's a corollary I have noticed... that many of the people who think that Obama's a bad president want to elect an unqualified narcissist who is very much like him in many important respects. They would follow up what they think is a bad president with another bad one... only this time it's ok because he's on their side. It has nothing to do with policies or sense... common or otherwise. It's pure Team politics, rooting for the Red or the Blue without regard to anything but "winning". Of course, "winning" doesn't ever have to be defined. Trump certainly never does it. But he'll tell you when you're winning, and there will be "so much winning" that you'll be tired of it. Don't think about it. So little thought is necessary in Team Politics that you might want to imagine those words -- and most "insightful" political comments -- emblazoned over an image of Jim Carrey's persona from Dumb and Dumber instead. and it would mean the same thing. By the way, that same search turned up links that claimed that Sam Elliott's politics are "none of your business" or that he's conservative; but also that he himself declares he's pro-choice. I don't know what his politics actually are; but he sounds like a man who speaks out to the issues, and doesn't cheer for the team. Hmm. These are links to videos such as "Unresolved Secrets of the Pyramids". Normally I'd just summarily delete such a comment as it has nothing whatsoever to do with this post, but I suspect it was intended for another post. So I'm just going to leave this here for a bit until such a day as I may get around to watching it. Don't be surprised if these links disappear suddenly, though. They don't belong on this post. 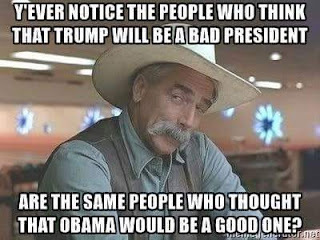 Sam Elliot knows what it is to endure - a long career in Hollywood means you let a lot of bs pass by, knowing it's not really directed at you, it's venting, not a part of the creative - or governing process. He knows the bs O has gone thru - and what kind of bs Trump spits up every five minutes. Not what a man does. Sam Elliot would not get along with that man. Ask him you don't believe me. Did YOU ask him, Joe? In every other case where he's been asked about politics it's been "none of your business". With regard to your comment, the problem with that is that Trump is on the record having every conceivable view on abortion. Most recently, in theAtlantic.com, Trump says that the Federal government's got no business regulating abortion. 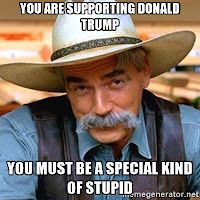 And Trump supporters fall on all sides of that issue, so it's as far from a litmus test as can be proposed. IOW, it tells us nothing. So if you have had that conversation to back up what you're saying, and you've got it on record, I suggest you take you take it to TheAtlantic or Huffington Post, or any of a number of news outlets and cash in on the exclusive.